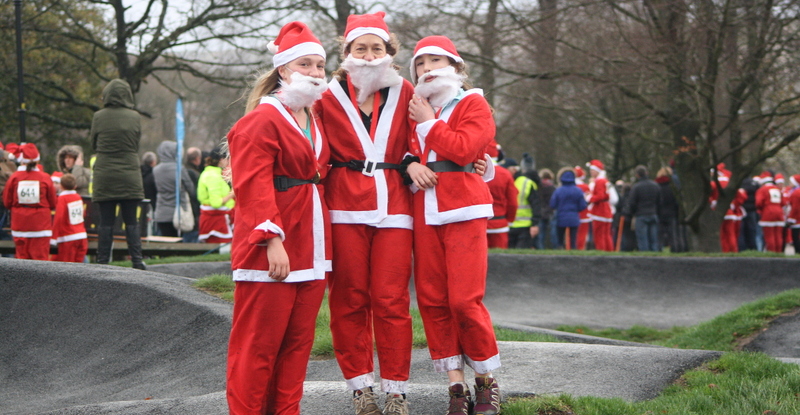 From Alison Weston ... Over 1,500 Santas took part in the Skipton Santa Fun Run, 5k around Skipton raising money for charity on Sunday from Aireville Park. Nea, Lyra and Alison Weston ran as a team in approximately 37 minutes. It took several minutes to reach the start line and then we followed the line of Santas along the route including road and canal, and returning on a track through the park. Very wild and windy in places with hats and beards disappearing along the way! Get in the Christmas mood, sign up for our Christmas Relays on 22nd December - see forum and Facebook posts! Thanks to all who got their early enough to collect their numbers and pay the £3 for them well in advance. Remember to keep your numbers for the remainder of the series and bring along to the next race. We do however have quite a few numbers left and it would be appreciated if you could arrange collection and payment before the 2nd race on the 13th December at West Park. Thanks and hope to see even more of your there next time. From Sarah Hayes ... John and I had a day trip to the Lakes to run this one off AM fell race starting and finishing near Rydal. It was a beautiful if bitterly cold day. The views were spectacular with the tops covered with a dusting of snow. The route was essentially out and back. It was a fixed route up to Loughrigg Fell summit but from there you could choose your route up to Silver How, doing the same on the way back. John kindly agreed to run with me and he was very encouraging (mostly). As I watched everyone warming up at the start I realised that I was a little out of my league. I adopted the race strategy of trying not finishing last which was successful - but only just! From Hilda Coulsey ... 23 Harriers fought their way through the floods. Geoff Howard was 1st M70. Lots of impressive times. This was an Ilkley Harriers Race League counter. And there were a record 59 junior Ilkley Harriers running! (A) A ready acceptance of the decision, tinged with a little regret that the run would be a bit less of a challenge than normal. Most runners, I sensed, fell into this category. (B) Relief that the last two big climbs would not, after all, have to be done. Added to this was the prospect of getting home earlier than usual on Saturday afternoon to languish in the bath indulging in excessive consumption of food and drink. (I fell into category B). Having said all this, the race was still a classic. We had plenty of mud, a bitterly cold wind, mist, rain, rocks etc. And there were still 4 big hill climbs to do. The marshals were out in force, cheerful as ever and seemingly impervious to the weather. 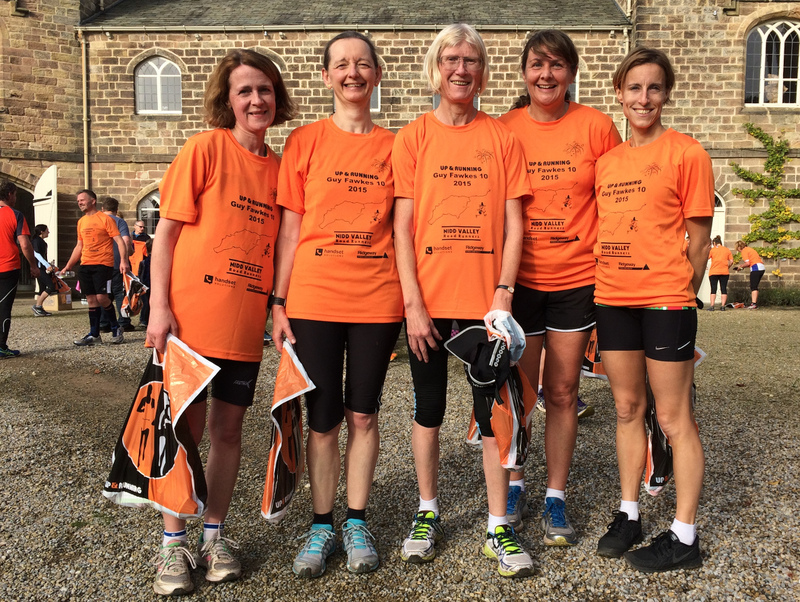 There were some excellent Harriers performances with Ilkley ladies team running brilliantly and scooping up 1st prize so many congratulations to them! A special mention also for our new recruit, Paul Carman, who came 33rd and was the first Harrier home. I had wondered - vainly - if I might have (finally) managed to achieve that elusive honour. But as I sprinted to the finish line holding off the tenacious Jane McCarthy, there was Paul who'd had time to finish the race, go to his car, pick up his very cute little dog and wander back to clap in his new team mates! From the results ... "This year the race was run over the Bad Weather Course following a route through Check points 1, 2, 3, 4, 5, 6, 11 and back to the finish. The last 2 climbs where excluded due to a forecast of heavy rain, high winds and low temperatures peaking in the area at 15:00. The estimated Bad Weather Course is 14 miles (22.4km) and 2700 feet (823m) making it a Category BL." From Michael Duffield ... It was a good decision to go with trail shoes for the Harewood 10M trail race. The rain lashing on Saturday meant that the paths and fields that could be affected by the rain, were, considerably. One or two runners who had opted for road shoes were doing Bambi on ice. The scenic course undulated around the Harewood estate, through woods and across fields with a significant climb in the last mile. Apparently, if you looked up, you could get a good view of the house at one point. Tea and soup in the hall afterwards was very welcome. 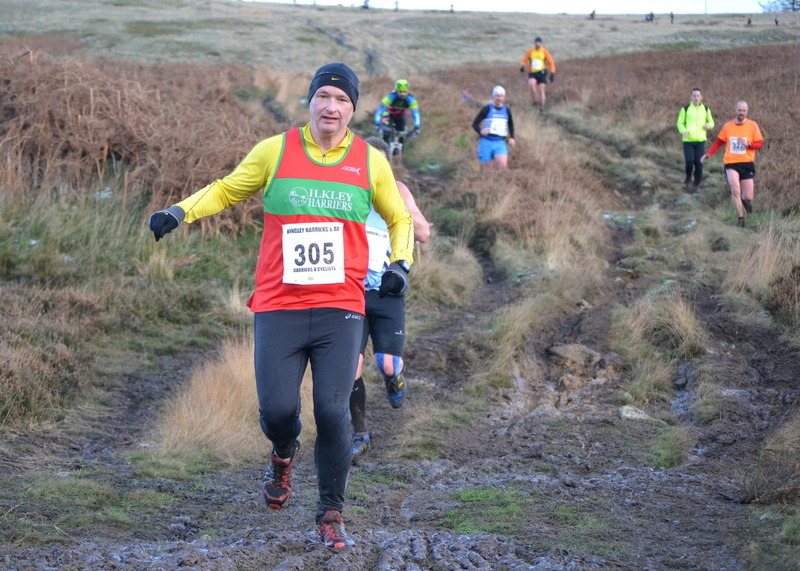 John Hayes reports ... One word to sum up the Burley Moor Run? "Muddy" must be a strong candidate. 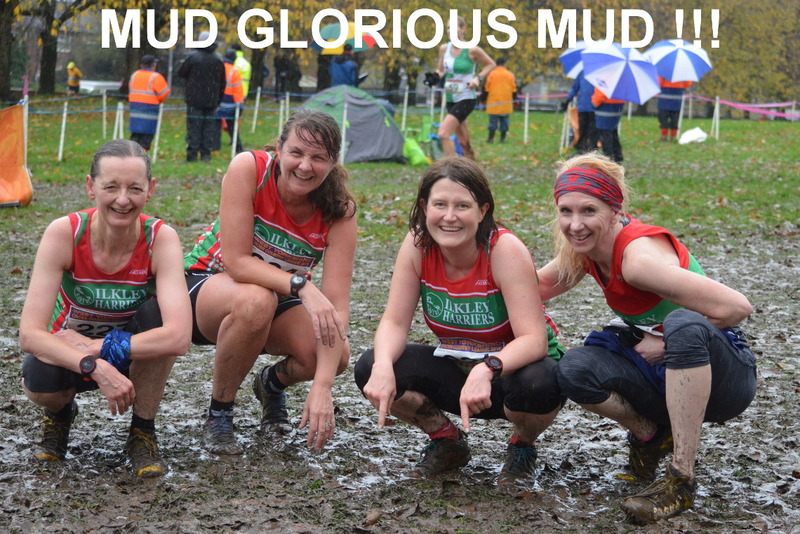 Not that this seemed to put off any Harriers who turned out in force at the race. The route is cleverly devised. After a long slog uphill, runners start to perk up with a speedy descent down the wide track beside the 3 reservoirs. But then they are presented with a steep climb back up the Moor edge before a final mad chase through the bracken and slippy mud back to Burley. Tom Adams came in first with a new course record and Jemima Elgood was the first lady. There were lots of other fabulous Harriers results. One of these was Daniel Hayes who came 12th and - more importantly (for him at least) - won the son -v- dad battle. I'll get over this soon I hope. Those who have hinted that this is the end of my running career are, I might add, being rather over-dramatic! Hundreds of children raced in the second Wharfedale Schools XC event hosted by Westville House School at Ilkley Rugby Club. Results soon (a bit waterlogged). Heads up, the last XC/trail race to count in our Ilkley Harriers Race League is confirmed now as the Peco XC on Sunday November 22nd at Temple Newsam. The last date to apply for numbers is 8th. If you haven't done so do it now to Gaenor and Steve Coy. From Petra Bijsterveld ... 10 Harriers made it to the Guy Fawkes 10 mile road race. A foggy start to the day made way for sunshine and unseasonably high temperatures. It all made for a lovely autumnal day but uncomfortably warm for racing. This year the race had a new route and it felt harder. The Birstwith Brute, 4 miles in, has now been extended to climb even further. Comparing the Strava record with 2014 the total elevation gain was virtually the same, but the fact that the winner took a couple of minutes more than previous years made me feel marginally better about my personal worst time in this race. There were some excellent results for other Harriers, with Jonathan Sinclair and Nick Richardson finishing under 70 minutes and Jane McCarthy hot on their heels only 3 weeks after her marathon, to finish 1st in her age category.